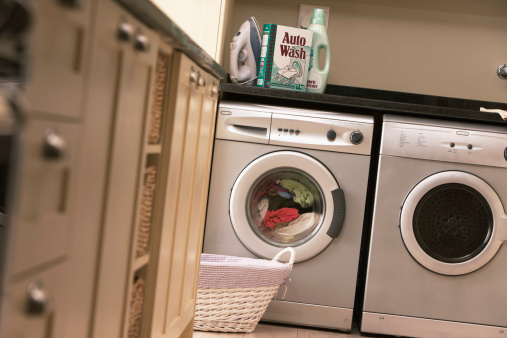 Front load washing machines hold several advantages over traditional top loaders. They hold more clothing because there is no agitator and use approximately two-thirds less water. Because front load washing machines use less water, they also use less laundry detergent and bleach. Adding the proper amount of bleach to a front-loading washer will ensure that the clothes are cleaned properly without being damaged. Avoid using an excessive amount of bleach in your front load washer. Locate the bleach dispenser on the unit. For many front-loading washing machines, the bleach dispenser is in the same drawer or compartment that houses the detergent and fabric softener dispensers. Pour 1/2 cup of bleach into the bleach dispenser. Adding any more bleach than this will cause damage to the clothing. Wash the clothing according to the label's directions. Remove the detergent, bleach and fabric softener dispenser drawers completely from the unit. Wipe down the drawers with a rag that has been soaked in soapy dishwater. Return the dispensers to their original position. Add 1/2 cup bleach to the dispenser labeled "Bleach." 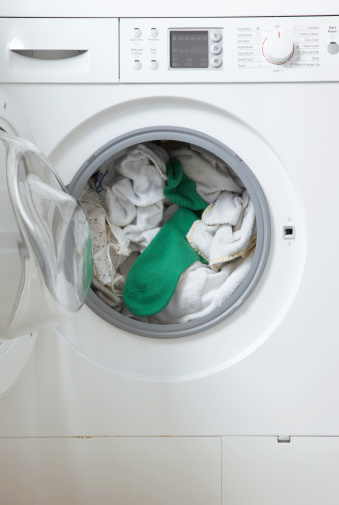 Run the washing machine on a regular cycle with hot water. Do not add clothing to the machine. The bleach will clean out the washing machine and remove any unwanted odors. What Is the Difference Between HE Detergent & Regular Detergent?